Site of the 19th century (1855) St.Peter's Church until 1939 and which became occupied with a 1950s high-rise (8-storey) block of flats and maisonettes. This Clifton Wood church was closed in 1938 due to the decrease in religiosity in 1930s Bristol. Cabot Tower (105 feet high), completed in 1897 to commemorate John Cabot's discovery of Newfoundland four centuries earlier. An interesting conundrum is the row of pallets extending down the right-hand side of Jacob's Wells Road. Timber storage for the sawmills at Canon's Marsh or could they be building materials for the pre-fabricated, single-storey housing units constructed in post-war Bristol (Sea Mills)? On an Edwardian large-scale map of the area, this building is shown as the Public Baths. Evidence of wartime bomb damage in the areas between St.George's Road and Anchor Road. St. George's Church, built in the 1820s and now a concert venue. Canon's Marsh freight line opened in 1906 and linked to Ashton Gate via the Ashton Avenue Bridge to the west-south-west. 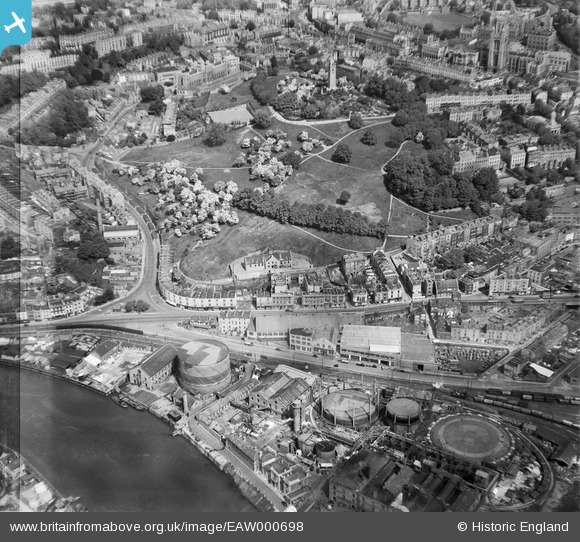 An interesting view of the area to the west of the city centre, only twelve months after the conclusion of World War II in Europe. Looking almost due north from a position over the Floating Harbour, the photo is readily compared to the large-scale maps of the period.